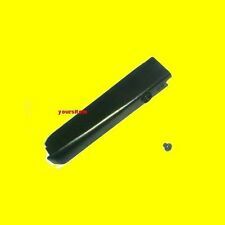 For IBM Lenovo Thinkpad T61 14.1" (widescreen). 2 x rubber rails. We might require you to send us photo/s of the item received and also your original item so we can compare and conduct necessary actions. IBM Thinkpad Lenovo. 1 x Hard Drive Caddy. 2 x Rubber Rails. FOR 14" NON-WIDE SCREEN / Standard Screen. 1 x Hard Drive Cover. Cover Size: Standard 14”. Compatible with：IBM/LENOVO Thinkpad T61 R61 R61i 14.1"Widescreen. 1x Hard Drive Caddy. 2x Rubber Rails. 1x Hard Drive Cover. One World, One Dream, We want to do a great job to provide you with the best cost-effective products! T60 T61 T61P T60P T400R400 X200 T500 W500 T410 T510 R60 R60E R61 Z60Z61T X201 X200S. For IBM Lenovo Thinkpad Lapot. 1 caddy x 2 rubber rails x 4 screws. 15.4 WS widescreen HDD Hard Drive Cover IBM Thinkpad Lenovo T61 T61p. Cover size: 15.4" WS (widescreen). Give us a chance to make things right for you, and we will do our best to provide a fitting solution. T60 T60p T61 T61p. 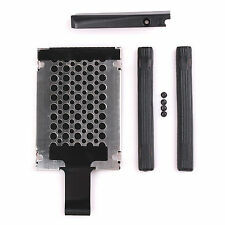 IBM ThinkPad Hard Drive Caddy, Rubber Rails & screws. 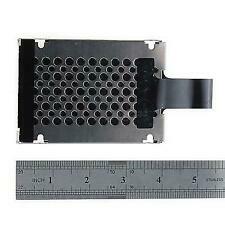 IBM Thinkpad Laptop 1pcs hard drive caddy. 4pcs caddy screws. 2pcs rubber rails. Compatible with：IBM/LENOVO Thinkpad T61 R61 R61i 14.1"Widescreen. 1x Hard Drive Caddy. 2x Rubber Rails. 100% New And High Quality. Picture:Pictures are only samples for reference. Compatible with：IBM/LENOVO Thinkpad T61 R61 R61i 14.1"Widescreen. 1x Hard Drive Caddy. 1x Hard Drive Cover. 100% New And High Quality. IBM P/N 42W2497. -Hard drive, Tray,and Rubbers are not included.